I couldn’t see how the framework would help other than to remind LA staff of different areas of need, since many of the needs of children with disabilities and their families involve ‘health’ – only one of seven types of developmental need, and not mentioned at all in relation to parenting capacity or environmental factors. The framework doesn’t unpack any of the factors into their component parts, even though the health issues of children with disabilities and their families are many and varied. In addition, some needs have arisen only because of service inadequacies; e.g. problems getting a diagnosis, a wheelchair, sufficient nappies, a suitable education or respite care. It seemed a bit pointless to be developing a comprehensive assessment framework when known needs couldn’t be met anyway. I’ve since discovered that the local authority in question didn’t devise this assessment framework. It was proposed by the Department of Health (DH), Department for Education and Employment and the Home Office in a document published by the DH in 2000 called Framework for the Assessment of Children in Need and their Families. The document is largely about the circumstances in which the framework should be used and who should use it. A companion document was also produced by the DH in 2000. It’s called Assessing Children in Need and their Families: Practice Guidance. I hoped it would explain how the Assessment Framework works in practice, which it does to some extent. The Practice Guidance contains four chapters. The first introduces the Framework, chapters 2 and 3 are dedicated to assessing the needs of ‘black’ and ‘disabled’ children respectively and the fourth is about resources. Chapter 1 sets out a now-familiar model of child development in terms of milestones and ‘optimal’ outcomes (1.4), but doesn’t explain how the concept of ‘optimal’ is arrived at. It sees children’s development at different ages as predominantly physical (infancy to preschool), social and academic (middle childhood) and social and emotional (adolescence) (1.4), despite physical, cognitive, social and emotional changes being important features of each period of development. Experience in infancy is framed in terms of attachment (1.5), attachment theory is presented as ‘relatively new’ (1.8) despite being developed in the post-war period, and there are claims for a ‘wealth of research’ into it (1.11) despite Barth et al finding only four evaluations of the theory in the social science literature since 1996. Child development is grounded in psychodynamic theory (1.12) and learning theory prior to 1980 (1.13). References to ecology of the child tend to refer to social ecology only (1.50). In my previous comments on this model of child development, I’ve pointed out that recent research in molecular and developmental biology doesn’t support a normative pathway for development; children have many similarities, certainly, but each child is developmentally unique. Physical, cognitive, social and emotional factors interact throughout development, implying that no aspect can be isolated from the others and that a model of child development grounded only in attachment theory is incomplete. The biological knowledge underlying psychodynamic theory has been superseded by a much more accurate understanding of the interactions between genes and the environment, and recent work in the neurosciences has made sense of earlier rather disjointed learning theories. But recent biological research isn’t reflected in the model of child development set out here. •	the model of child development presented and the Assessment Framework are policy-based rather than evidence-based. OK, now to explain those points. In 2000, the Department of Health would probably have justified the inclusion of chapters dedicated to ‘black’ children and ‘disabled’ children on the grounds that their needs have been consistently marginalized for a long time. Although that is undoubtedly true, I would argue that a normative model of child development by definition creates demographic groups that don’t conform to the developmental pathway of a hypothetical average child. A normative pathway is challenged by any child who in any respect falls outside the normal range. Children and young people from ethnic minorities, whose first language isn’t English, who don’t fall into neat categories in terms of gender or sexual orientation, have minority religious or philosophical beliefs or unusual lifestyles, are chronically sick, have long-term functional impairments, minor problems with motor control, speech or attention or who have specific learning difficulties are all unlikely to meet their developmental milestones. This poses a problem for anyone assessing a child’s needs according to a normative developmental pathway because they have to figure out which exceptions are acceptable and which aren’t. The big problem with a normative model of development is that services based on it are designed to meet the needs of a hypothetical average child, not the needs of all children. As a consequence, frontline practitioners such as GPs, teachers and social workers have been trained to address the needs of children following an average developmental pathway, but not the needs of all children. Another consequence is that all exceptions to the average pathway have to be treated as special cases, so we have ‘black’, ‘disabled’ and ‘poor’ children and those with ‘special educational needs’, for each of whom special provision has to be made. Special provision comes with a price tag, and a price tag attached to a specific demographic group is politically vulnerable. The group itself becomes vulnerable if children within it or their families are seen as being unwilling to achieve the milestones they are supposed to aspire to. By contrast, a model of child development that recognizes the inherent natural variation between children in different aspects of development would be more likely to result in services designed to meet the needs of all children, with professionals receiving appropriate training, and wouldn’t generate a plethora of special cases. The social model of disability locates disabilities in their societal context. In other words, someone might have what’s described as a ‘functional impairment’, but what actually prevents them leading what most people would consider a normal life isn’t the functional impairment itself, but barriers to leading a normal life that society imposes or fails to remove. Say for example, Mrs A is unable to work because she’s severely short-sighted, but because she can’t get a job she can’t afford the spectacles that would give her 20/20 vision. Mrs A’s problem would be resolved by giving her access to affordable spectacles. That particular scenario isn’t currently a problem the UK, mainly because so many people have impaired vision, but it illustrates the point. Viewing phenomena in their societal context is a powerful analytical tool, because it enables us to see relevant factors that are sometimes invisible when we take the societal framework for granted. As human beings we tend to prefer people who are similar to ourselves – in appearance, beliefs, values and lifestyles. (Note that this is a tendency, not a hard-and-fast rule.) As a consequence we assign others to ingroups – people we feel comfortable with and/or approve of, and outgroups – people we don’t feel comfortable with or disapprove of. Often our perceptions of outgroups are over-simplified (stereotyped) because we don’t know much about them. The social model of disability addresses the tendency of the non-disabled majority to make the implicit assumption that everybody is non-disabled like them, and to ignore (accidentally or deliberately) the needs of the whole community. In other words, the able-bodied majority, as a whole, holds a normative model of human functioning that implies that everyone can or should function like the able-bodied majority. A normative model of child development is in serious danger of creating precisely the kind of situation that the social model of disability has been developed to address; that a majority group assumes that everybody is like them or should be like them (or as is often the case, a group with resources decides how groups without resources should behave). Just as this assumption creates disabilities that wouldn’t exist in a society that actively addressed the needs of all its members, so a normative model of child development creates problems for children who can’t or don’t want to conform to the developmental pathway of the hypothetical average child. That’s certainly true, but tends to belittle the effect that ‘impairments’ can have. Most people would think it unacceptable if someone couldn’t obtain spectacles that corrected a visual impairment, or crutches if they had broken a leg, but it’s currently very difficult to obtain comprehensive assessments, never mind treatments, for impairments that cause significant sensory, attentional, communication or mobility problems for children. Framing disabilities only in terms of social factors and failing to give GPs, teachers and social workers adequate training with regard to functional impairments, has, I suggest, resulted in some of the service structure failings paragraph 3.10 refers to. The DH describes the Framework as ‘systematic’ (Framework p.viii). I think what it really means is ‘comprehensive and consistent’, because the Framework isn’t actually systematic, but instead provides a checklist (albeit one divided into different domains and arranged in the form of a triangle) that helps identify the kinds of needs children have. The defining feature of a system is that it has interacting component parts, so for the Assessment Framework to be systematic it would need to show how its components interacted. As the Framework is presented, it’s just a list. One thing it doesn’t do is help identify the ultimate, rather than immediate causes of children’s needs. Obviously, if a child has serious immediate needs those will take priority, but identifying ultimate causes is essential if needs are to be met effectively over the long term. Nor does the framework indicate how needs and/or their causes interact – essential if appropriate services are to be provided in a timely and cost-effective manner. I agree with the DH (Framework p.ix) that those assessing children and families shouldn’t be expected to follow a manual and should instead should use their professional judgement, but some indication in the Framework of the ultimate causes of children’s needs and the way factors interact would have been helpful, especially given the inadequacies in training highlighted recently. However accurately those working with children identify the types of need they have, unless the causes of the needs are accurately identified as well, it will be impossible to prevent the needs arising. Evidence is used in many domains to inform decision-making. The aim, whether the decision relates to guilt or innocence, right or wrong, or the validity of a scientific theory, is to evaluate all available relevant evidence, so the decision best reflects the situation in the real world – what actually happened or happens. In the judicial system a judge or jury does the evaluating, in a formal debate it’s the audience, in government it’s parliament and in science it’s scientists. In the judicial system, debating and politics, each party involved cites evidence that supports their case and downplays evidence that doesn’t. Scrutiny by the opposing party is supposed to expose any flaws in reasoning. But people working in those domains aren’t usually the ones doing the evaluating so there’s a risk of them losing sight of the importance of taking into account all the evidence and instead to focus on evidence that supports a particular case. and sets the Framework in the context of national and international policy (p.viii). In other words, the starting point isn’t data on children in need, but government policy in relation to them. Supporting evidence for the policy is then cited in the form of a model of child development that’s based on partial and out-of-date information. Recent findings from molecular and developmental biology aren’t mentioned, nor is the policy framework itself critiqued (see for example Garrett, 2003). This isn’t surprising since it’s a government publication, but it’s not evidence-based in the scientific sense. The fact that biological factors are presented as a novel area of research and that only Perry’s work (of which more in a future post) is cited in relation to sensory information and brain development suggests that the authors of this chapter are less than familiar with the vast biological literature on this subject. This brings us back to the comparison I made in another post, between Leo Kanner and Bruno Bettelheim regarding their level of expertise and the way they handled evidence in relation to children with autism. Kanner was up to speed with developmental biology, and used contemporary theory to develop hypotheses, which he then tested against data. As the data changed, so did his conclusions. Bettelheim knew about psychoanalysis and philosophy but didn’t have a biological background. He decided from the outset what was causing the children’s unusual behaviour and cited supporting evidence only. The outcomes of their work were very different; Kanner’s highlighted the developmental problems of a large group of children, Bettelheim’s resulted in needless guilt and misery for many parents and quite possibly wasted a substantial research grant from the Ford Foundation. In the case of the Assessment Framework, it’s difficult to avoid the conclusion that the Department of Health, bizarrely, doesn’t appear to know anything about research in developmental biology or genetics since the 1950s, nor much about how systems work or what expertise is necessary in order to identify children’s needs. Some years ago, I complained to a government department that I couldn’t trace documents cited as evidence in a Green Paper because the references to them weren’t detailed enough. The minister concerned responded, rather tartly I felt, that the Green Paper wasn’t an academic paper. The implication was that academics might have to subject their evidence to public scrutiny, but government wasn’t obliged to do so. Personally, I don’t doubt that the intention of the previous UK government in relation to children’s needs was benign. Unfortunately, in order to be effective policy has to reflect the real world, not just part of it, and has to take into account the actual causes of those needs whether they are located in individuals or in flawed social policy, legislation or service delivery. A scientific approach to evidence stands a better chance of doing that than offering only evidence that supports what’s ultimately a nice idea. Science, like democracy, might not be perfect, but, also like democracy, it’s the best system we’ve found to do the job. Barth, R.P, Crea, T.M., John, K, Thoburn, J. & Quinton, D (2005). Beyond attachment theory and therapy: Towards sensitive and evidence-based interventions with foster and adoptive families in distress, Child and Family Social Work, 10, 257–268. Department of Health (2000). Assessing Children in Need and their Families: Practice Guidance. London, TSO. Department of Health, Department for Education and Employment and the Home Office (2000). 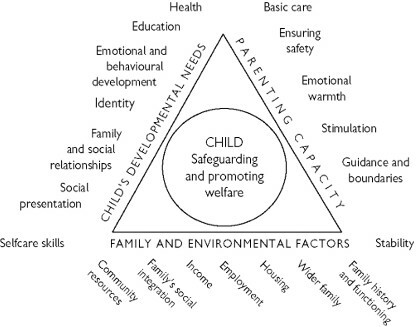 Framework for the Assessment of Children in Need and their Families. London, TSO. Garrett, P.M. (2003). Swimming with dolphins: The assessment framework, new Labour and new tools for social work with children and families, British Journal of Social Work, 33, 441-463.
what’s wrong with attachment theory?